Fasting will elevate BDFN levels;3 The mind becomes focused when the need for food for survival looms large, and BDFN levels rise. HIT is what we do at our Austin Personal Training and New Orleans Personal Training facilities. 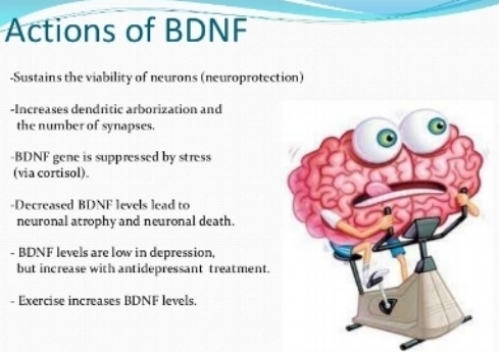 Declining BDNF levels can be reversed. It is best to take steps to do it now. Studies in animal models have shown that new neurons are produced in the brain throughout the lifespan, and, so far, only one activity is known to trigger the birth of those new neurons: vigorous aerobic exercise, said Karen Postal, president of the American Academy of Clinical Neuropsychology. “That’s it,” she said. “That’s the only trigger that we know about.” Vigorous exercise in the form of High Intensity Interval Training (HIIT) is what we do at New Orleans Fitness Trainers and Austin Personal Training. Regular exercise improves our ability to think and remember through the creation of new brain cells, a process known as neurogenesis, the growth and development of nervous tissue. Another blog post on the same subject: Growing new brain cells by exercising. The latest research shows that cognitive decline is not inevitable…the brain continues to make new neurons and fine tune neural connections as we live…Aerobic exercise jumps-tarts that process and slashes your lifetime risk of Alzheimer’s’ in half and general dementia by 60 %. Is it to late to start if you are already older? According to the article No. Can aerobic activity cognitive benefit younger people? Absolutely, more on that in a later blog post. At Austin Personal Training and at New Orleans Fitness Trainers we can help you gradually build up to a high intensity program that is safe, effective, and efficient for your age and it will have your breathing hard. Our oldest client is 88. Using such a program you can expect to feel better and have a dramatic improvement in your health. The sixteen men in the study did not achieve the same positive cognitive results. They postulated that the difference was possibly because the body's use of and production of cortisol, insulin, and glucose differed in women and men. Regardless, the long list of positive changes resulting for high intensity exercise makes it worth the investment of one’s time. All participants exercised at 75% to 85% of heart rate reserve and mean age of the group was 70 years old with the oldest being 85. At Austin Personal Training and at New Orleans Fitness Trainers we work with people of all ages in a high intensity fashion. High intensity varies by individual depending on their level of fitness. For those who are older the bar need not be that high to achieve high intensity exercise. To produce change you need to expose the body to more that it is used to handling. We follow a simple protocol: Safely expose the body to more exercise than it is used to handling (longer duration, a greater distance, a quicker pace, or more weight lifted). Allow enough time for recovery and rebuilding. The body will then make a positive adaptation as an act of self-protection. When done correctly the human body is the only engine that improves with use rather than wearing down.